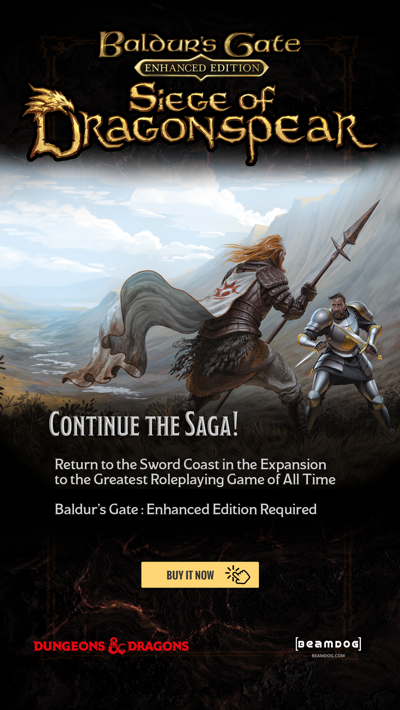 This week we reprint one of the short stories written by Dave Gross for the Baldur's Gate: Enhanced Edition characters. 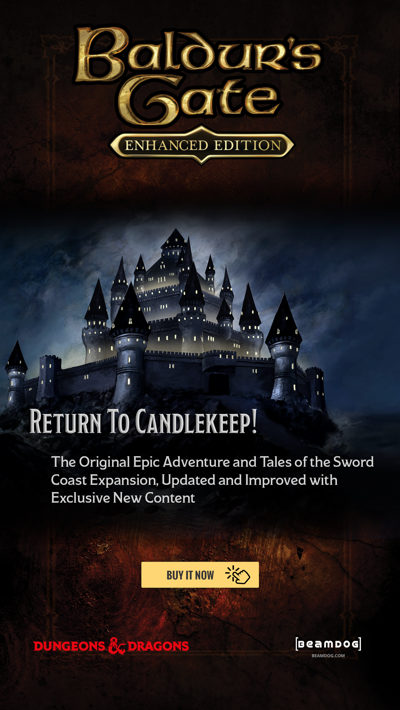 These stories were originally posted on the Candlekeep Library. Enjoy the tale of Neera's time studying magic in the High Forest. "Oh, my aching noggin." Moth cradled his head as he slumped down the great oak's winding ramp. His iridescent wings drooped. "You should know better than to drink so much nectar the night before class." Pollae planted the foot of her oaken staff in the moss and raised a fine elven eyebrow to look down at him. Neera didn't like the way Pollae used her height to belittle the pixie. At barely over two feet high, Moth was small even for a sprite. He had spent half the night flitting from bloom to bloom, sampling every night-blossoming flower he could find. Neera understood the allure of spring. The same perfumes had tempted her outside to tease the boys when she knew she should be studying. As a result, Neera was also completely unprepared. "Lean over the rail if you're going to throw up," said Binster. "Don't say 'throw up'!" moaned Moth. "Sorry. Still, you can lean against the rail for support." For a gnome, Binster was depressingly practical about the most mundane things. Unlike every normal person who looked out across the village and saw vibrant leaves and blooming garlands, Binster saw only the utility of the railing. With an imagination like that, Neera thought, Binster would turn out to be a lousy illusionist. Still, the way he comforted Moth gave her an idea. "If you time it right, Moth, you can hit that wagon." Neera pointed down at an approaching haywain jigging and hopping over the roots below. Its erratic motion made her feel queasy, and she hadn't had a drop of nectar. At the sight of the careening wagon, Moth clutched his stomach and burbled. "Stop it, Neera," said Binster. "You know how suggestible he is." "I'm not just saying he's going to throw up. I'm saying when he does, it'll be right on that wagon. In fact, I've got half a dozen faerie-lace ribbons that agree with me." From her belt pouch she drew out six shimmering lengths of gossamer, hand-woven by the tiniest atomies. "Want to bet?" "No," sniffed Pollae, but Neera saw the desire in her eyes. Pollae loved faerie lace, and she was never one to back down from a challenge. She was the best student in their magic class, and she never missed a chance to remind the others of that fact. Pollae eyed Moth. "How're you feeling?" "Better," said the sprite. His cerulean eyes had lost some of their luster, but he was no longer puffing his cheeks like a landed carp. Pollae turned on Neera with a savage smile. "You're on." "My faerie lace against that old staff of yours." What? This was my grandfather's!" "Steady on, Moth." Binster knelt beside the sprite and patted him on the back. "Don't jostle him!" Pollae and Neera cried in unison. Moth opened his mouth to say something, but only a golden bubble emerged. "Very well, your lace against my staff," said Pollae. "But neither of us can touch him or use any magic." Pollae turned to Moth. "Close your eyes. Don't look down. You aren't going to throw up." "Don't say 'throw up,'" said Binster. "He doesn't have to look down to know he's going to throw up," said Neera. The wagon drew closer. "Moth can hear as well as we can just how wobbly that wagon is, rattling over every pothole in the path, throwing up stones with every lurch. Why, the sound itself is enough to make you-"
Repetition wasn't working. Neera chanted in desperation: "Barf, vomit, hurl, gag, cast a color spray, sick up, spew-"
A glittering stream of pixie puke arced down on the haywain. By the time Neera had claimed her prize, soothed the angry driver, helped clean up Moth, and dashed across the village, the other students-all of them young elves-had already assembled. Unlike most of the village tree-chambers, the classroom stood only a few feet above the forest floor. A domed roof sheltering it from rain, but all the shutters had been removed, leaving it open to the breeze except where it abutted one of the giant oaks for which the High Forest was famous. The teacher whisked his tail as the latecomers rushed up the ramp. After glancing at the others, especially Moth, who hung on to Binster for dear life, his gaze came to rest on Neera. The centaur quirked a shaggy eyebrow at the sight of Pollae's staff nestled in the crook of Neera's arm. "Late again." "Not my fault," said Neera. Frixis stared at Neera as if she'd just confessed to a crime. His fingers idly touched the beads braided into his magnificent green beard. He was the hairiest centaur anyone in the High Forest had ever seen. It was impossible to see where his beard ended and his chest hair began. He had never approved of Neera's sense of whimsy nor her peculiar approach to magic. Centaurs were not known for their skills at arcane magic. Through relentless discipline, Frixis had achieved such skill that the elves of Highbough made him the instructor for their magic school. When Neera had first applied, she impressed the centaur by demonstrating great natural potential, but none of his discipline. She had only disappointed him ever since. Neera didn't see magic the way Frixis did. She understood the mechanical aspects of casting a spell-the words to speak, the gestures to make, even the physical materials (nasty as some were) necessary to call the magic from its source-but she felt deep in her being that much of the rigmarole was unnecessary. Studying all of the theory and history of magic was like reading a book to learn how to dance. The way Neera saw it, either you could dance or you couldn't. Likewise, either you were a mage or you weren't, and no amount of studying would change that. Still peering at Neera, Frixis said, "Which of you wishes to demonstrate your new spell for the class?" Neera wished she had prepared an invisibility spell to vanish from sight, but the centaur kept staring straight at her. Fortunately, to either side of Neera, her friends threw up their hands. Pollae and Binster were always the first to volunteer, and both were always prepared. Neera was sure the gnome had gotten that seam on the tip of his long nose by sticking it too deep into his books. "Very well," sighed Frixis. "Pollae first." Binster sighed his disappointment, which only encouraged Pollae. "Perhaps it would be nice to have a well-mannered gnome in class, for a change." She faltered for an instant as she moved to gesture with the staff she had lost in the bet. It would be a lot harder to look down at Neera after that defeat. Pollae performed the gestures by hand, spoke the words, and with a glimmer appeared to transform into an exact duplicate of Binster. To complete the illusion, she mimicked his heavy sigh. Laughter from the other students rewarded her effort. Binster snorted. "That's nothing. I can do twice as well." With a two-handed gesture and a few arcane words whistling out of the gap between his front teeth, he caused his own image to shudder and divide into several duplicates. Each stepped away from him until four identical Binsters stood with their hands on hips, smug smiles returning Pollae's scowl. They said in unison, "Four! Four times more gnome!" Again the other students laughed. Frixis nodded his approval. "Now, who will be next?" Moth's wings perked up. "Those are just illusions," he said. With a few arcane words of his own, the pixie grew taller, his wings shrinking into his body as his flesh and clothing changed shape until they matched Binster's features exactly. "This is a real transformation." "Very good, Moth," said Frixis. "Now, Neera-"
"I didn't know we were doing illusions," she complained. Fire and lightning were more her style, any form of energy she could evoke from the raw fount of magic. Frixis stamped a hoof on the hard oak floor of the classroom. Amplified by the domed roof, the sound echoed off the nearest tree-houses. From the nearest buildings, elven laughter replied to the centaur's familiar gesture of impatience with a recalcitrant student. "If I must," huffed Neera. "Take cover, everybody!" cried Darvoth. "Neera's going to cast a spell!" The pathetic thing was that everybody laughed, which Darvoth had been making ever since that first time Neera's concentration wavered and a surge of wild energy turned what should have been a simple levitation into a flock of sparrows who whitened the entire classroom in their fright. Neera showed Darvoth her teeth. He wasn't even handsome compared to some of the other young elves. She liked him better when he'd been one of the boys fetching her flowers last night. Maybe making fun of her was his revenge for her sending him after buds she knew would not bloom for weeks yet. Or maybe he was just a jerk. As she raised her hands to make the opening gestures, Frixis shook his head at her and raised his own to show her the correct position. "Think," he said. "Focus, visualize the runes you studied." That would be much more help if she had actually studied, Neera thought. She didn't understand why it was so important to do things exactly so. Why wasn't there any room for improvisation, for her natural talent to come out? Master Frixis's corrections made her feel exactly the same way as when her writing teachers forced her to use her right hand instead of her left. Neera whipped her head around to see the origin of the rude sound. She imagined Binster blowing a raspberry behind her back, but the six gnomes-one polymorphed pixie, one illusion-shrouded elf, and four reflections of the original, all stared back at her, mouths agape. Just as her fellow students' laughter erupted louder than ever before, Neera realized the sound was that of her own spell fizzling. All of the others in the classroom slapped their thighs, pounded on their neighbors' backs, or rolled on the floor. You'd imagine they had had never seen something so hilarious, thought Neera. She was the only one who didn't find it amusing, or so she thought until she saw Master Frixis shaking his head at her, his broad face a study in disappointment. "Perhaps it is best that you go home, Neera." Frixis had sent a student home from class only once before. Later he'd gone to the boy's parents and counseled them to devote his energies elsewhere: farming, hunting, woodcarving, perhaps. He was not destined to be a mage. "No, I can do it," said Neera. "Maybe not the image of a gnome, but- Here, look!" She hastened through the gestures to call up an image of a fiery gnome above her palms. She felt the arcane energies respond to her will as much as to her gestures. This was more like it-the natural evocation of magic from its very source, not the careful teasing out of its threads for a spell practiced by thousands of other casters over the centuries. A brilliant orange flame blossomed in Neera's hands. She could even feel the heat of the illusion. This was no meager cantrip. This was real magic. "Neera, look out!" cried one of the Binsters. He transformed back into the form of Moth even as he leaped away, pixie wings limned in fire. "I'm not doing it. I didn't mean-!" Frixis charged in to scoop up the terrified Darvoth, but he was too late. Even as the centaur reached out his arms, Neera's conjured ball of flame engulfed the boy. Darvoth screamed and turned to run. He made it almost to the edge of the classroom before Frixis knocked him over the edge onto the grass, shouting, "Roll it off! Roll it off!" "What have you done!?" Pollae screamed at Neera. In her anger, she allowed the illusion to fall away, and the angry young gnome became an angry young elf. "You never pay attention," the four remaining Binsters scolded her. "Now look what you've done!" "That's not- I didn't mean- Oh, I hate you all!" Neera raised the staff she had won from Pollae, wanting desperately to hit someone. Pollae and the Binsters flinched and stepped back. When she saw the fear on their faces, Neera felt horrified-not by her friends, not by the situation, but by herself. Tears on her face, she turned and ran away.